So I started something different. I wanted no obvious effects, but still something technical. 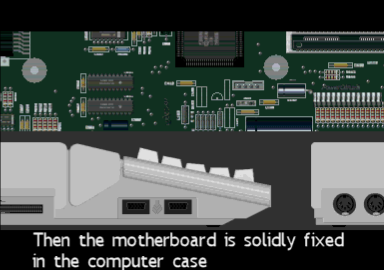 The reason is that most people nowadays have no idea about the technical limitations of old-school machines, and they will tend to dismiss something that looks ugly (compared to other things they can relate to), even if it is technically incredible. On the other hand if you do something containing only design and graphics, you will disappoint people who know the ins and outs of the machine. The solution? Well, I tried to do something with a lot of graphics (simple style to avoid showing the obvious limits of the machine), transitions, synchronization with the music, the whole being displayed in left and right overscan to simulate wide-screen format with one palette per scan-line to give the technical edge to satisfy people. In the end I did all the code of Save The Earth, most of the graphics (CRem from MJJ Prod made the sprites for the Defence Force logo, and Elitar made the truck), and Excellence in Arts made the music. Thanks to him for helping pushing the demo forward toward the end, because I was really starting to feel the exhaustion! You can download the demo on pouet.net or vote for it on Atari Mania.